+1 to that. And it sounds like he is not caching his water in Bear Containers either. I'd have to say there seems to be some great potential for overlooks on the southern end of MDA. We checked out one on our trip in January of 2017, and it was awesome. Randell's Overlook is tough to beat though. Opinions DO vary. Now we know who placed the ammo box up there that DesertRatShorty found in his MDA hike last year. Ammo box from DRS' trip report. The reference to Hayduke and the 700 mountains that William Hennessy has climbed makes me wonder if BBC's own Hayduke are one in the same. 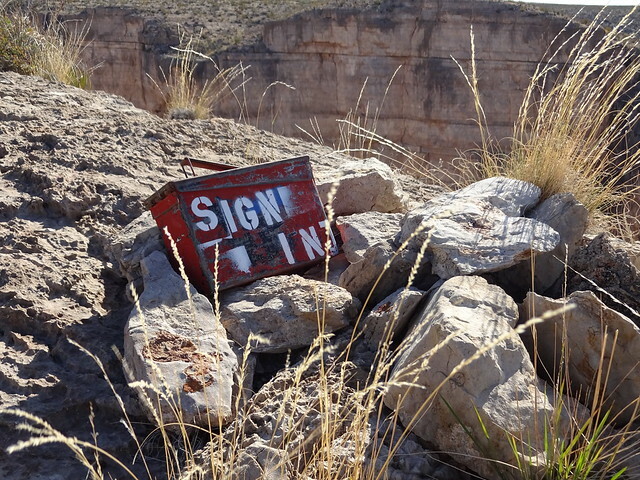 Hayduke has bagged a lot of peaks in the park and lives in Terlingua, so could be him. While Randell's Overlook is great, I think it is very similar to the view at the top of the RGV-to-the-Hot Springs Trail. I don't think there is a better view anywhere in Texas at least than from the South Rim. Have you been to Randall’s? Man, it's hard to definitively call one specific spot the prettiest in Texas, them's fightin' words! But if you said the prettiest spot in Texas is in Big Bend, I'm not going to disagree with you. Although I could understand if someone else thought it was in BBSRP, GUMO, or the Davis - I'm 100% sure it's west of the Pecos! That was a very well-written article. And that can't always be said about "a guide took me there" pieces. Agree with Lance: Hennesey sounds a lot like Hayduke. Also sounds like Randell's Overlook is Hennessy's second favorite place in Texas.